The Bureau of Meteorology forecast for Saturday, issued on Friday was not looking too good. Cloudy. Scattered showers with possible hail. Scattered snow showers about the ranges above 800 metres. The chance of thunderstorms from the late morning until evening. Winds northwesterly 15 to 25 km/h. Overnight temperatures falling to between 2 and 6 with daytime temperatures reaching between 7 and 12. A couple of weeks since activating SOTA summits and a less than ideal forecast was not going to keep me away. I planned and packed for wet weather and decided I would assess each summit on its merits at the time of arrival. After leaving home a little before 6:00 am, I stopped for fuel at Berwick and stopped again at Yarra Junction for some snacks to take up the hill. I had researched this hill by talking with Kevin VK3KAB and reading the blogs of Wayne VK3WAM and Glenn VK3YY. I headed 27 km north from Warburton along Acheron Way, turning left at Carters Gap Rd. Along the way some recently fallen trees had been partially cleared by others, leaving enough room for me to pass. I reset the trip meter when leaving Acheron Way and made the following notes while heading up hill. 5.1 km sharp turn right. 7.7 km gate across road. 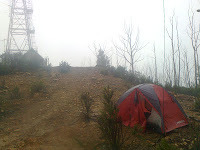 I parked at the gate, loaded up the pack with radio, antenna and tent and walked off toward the summit. Once on the summit I looked back toward the gate and was not convinced that I had started outside the activation zone. To be sure I headed over the summit and about 500m down Mt Vinegar Rd until I was well out of the zone. 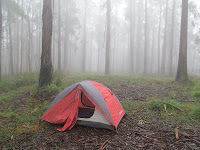 Returning to the top I found a suitable tree on the west side of the road, so as to also be in the Yarra Ranges National Park, and set up the tent. 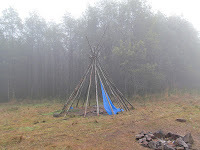 The weather was OK but since I was planning to be on the hill for about 1 hour I wanted to be dry and the tent was ideal. After a couple of throws with the 16 oz throw bag I had a rope over a branch and set my linked dipole antenna up with the apex at about 11.5 metres. I gave a few calls on 20 metres for any Keith Roget Memorial National Park Award chasers but got no response. Jumping down to 40 m got me a summit-to-summit contact right away with VK3FMDV on VK3/VC-006, Mt St Leonard, followed by 19 QSOs before 0000 UTC and 16 QSOs after 0000 UTC, including 4 on 12 m as part of the SOTA 12 metre challenge. My Nexus 7 tablet is off being repaired so I couldn’t run my logger app so I was using paper and pen, something I haven’t done for quite a while. I started packing up at 10:25 am just as it started to snow. I took some phots but the batteries in the camera went flat and later wouldn’t charge. The snow lasted for about 10 minutes and cleared as I was walking away from the summit. From Mt Vinegar I returned along Road 8, continuing northwest past Carters Gap Rd toward Dom Dom Saddle. Before reaching Dom Dom Saddle the road takes a right turn and meets Dom Dom Rd, about 1.8 km from the Dom Dom Saddle, or about 300 m west of where Rik VK3KAN suggests parking to access Mt Dom Dom. It was here I made a classic navigational error. I looked at Rik’s map, which doesn’t show the road I had come along, and presumed I was much closer to the Saddle than I actually was. Looking at Rik’s map its about a 2 km drive from the saddle to the parking spot so I drove about 2 km east on Dom Dom Rd until the track got so bad I thought I must be going the wrong way. I pulled out my GPS and, sure enough, I had missed the parking spot. I turned around and drove back to the parking spot. It was raining quite heavy so I decided I would give this summit a miss and head further north to VK3/VN-027, Mt Gordon. Finding Mt Gordon is quite easy really. 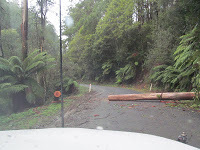 From Dom Dom Saddle car park turn right on to Maroondah Hwy and then follow the signs toward Marysville. Mt Gordon Rd is on the left just before the Marysville Trout & Salmon Ponds turn off. Mt Gordon Rd leads up to a locked gate about 300 m from the summit. At the gate I was unsure if I was or wasn’t in the activation zone so I walked 250 m back down Mt Gordon Rd until my GPS got a fix and showed I was well outside the zone. I then walked back up, past the car and to the summit. 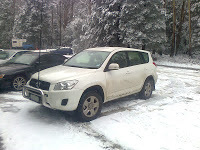 It had started snowing as I left the car and continued to snow on and off until I started to pack up. I set the tent just past the summit and spent about 15 minutes trying to get a line up and over a branch. The first two attempts ended up getting tangled while the third attempt was successful. I rigged the antenna and was on air just after 1:00 pm and worked Wayne, VK3WAM, who was on VK3/VU-012 Mt Korong. Another summit-to-summit contact to start the activation. I moved up the band a little and worked 24 stations on 40 m and one station on 12 m before packing up around 2:00 pm. The snow had stopped but the area I had set up in had turned to mud and the tent fly was saturated. 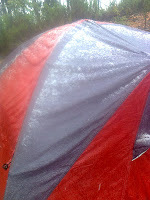 A bit of snow had also come inside the tent whilst I was setting up and the floor was quite wet as well. I walked back over the summit, to my car, and headed back toward Narbethong. Since I had not walked to Mt Dom Dom I was now ahead of schedule so I decided to head back down Acheron Way and try VK3/VC-002 Mt Donna Buang for the winter bonus points. The drive down Acheron Way was slow with rain and snow falling. As I drove up Mt Donna Buang Rd the snow on the ferns and ground got thicker and thick. When I arrived at the top gate, which is just outside the activation zone, the snow was thick on the ground and more was falling from above. I grabbed my pack, without the saturated tent, and headed up the hill. I set the antenna in a tree near the edge of the clearing and set the radio, still in the pack, under the pack cover on a snow-covered table. I called on 7.090 MHz and Peter, VK3PF, answered and posted a spot on sotawatch.org. 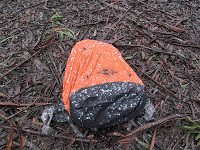 Soon the chasers came and within seven minutes I had 11 QSOs in the log, snow piling up on the pack cover and, despite my waterproof pants, a cold bum from sitting on the snow covered seat. I don’t normally close down so soon after starting but the snow was getting into the pack and I wasn’t getting any warmer. I apologise to any chasers who missed out. I packed up and walked back to the car park to some strange looks from passers by as I hiked along in the snow with a full pack on my back. I took a couple of photos in the car park, since I hadn’t taken any at the summit, and I was off home. Snow is very wet when it melts. My Thinsulate gloves are useless when saturated. Road 8 from Mt Vinegar meets Dom Dom Rd in two places, one with a gate and one without. Paper logs are difficult to write on under a pack cover in the snow. NiMh batteries don’t like the cold.